But for all the understandable interest in St. Francis that the papal election has generated, it’s noteworthy that at least two commentators found another point of comparison in the person of another, older saint: Augustine of Hippo. …another revival movement arose, embraced by Augustine, who was Bishop of Hippo. The problem with the Donatists, Augustine argued, is that they are too static. They try to seal off an ark to ride out the storm, but they end up sealing themselves in. They cut themselves off from new circumstances and growth. …Far from being a stable ark, the church would be a dynamic, ever-changing network, propelled onto the streets by its own tensions. Augustine had this deep, volatile personality. His ideal church was firmly rooted in doctrine, but yearning for discovery. While the second is “rare because it requires a lack of defensiveness, and a confidence that your identity is secure even amid crisis,” he found hints of such qualities in the former Jorge Bergoglio. 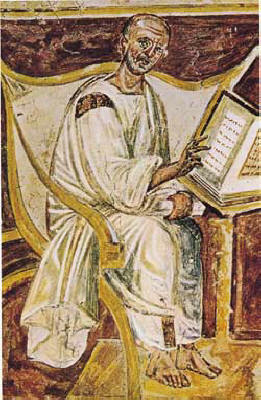 Then intellectual historian and Augustine biographer Miles Hollingworth argued that Augustine exemplified how the new pope might straddle the legacies of both his namesake (“the third world candidate of a modernizing Vatican”) and his predecessor, Benedict XVI (“the Augustinian scholar and long time ‘doctrinal watchdog'”). …one of the age-long challenges for Christianity and the Church has been to meet and overcome the world’s confidence when it claims that it understands realism best. This is not surprising: Christ proclaimed an otherworldly message on behalf of the spirituality of the human soul, and since then a critical purpose of the Church’s mission has been to preserve that otherworldly beauty in the integrity of its sacraments. At a time like now, when the world feels confident again to remind the Church that she should remain in touch with real problems, Augustine’s life and preaching offer a more nuanced perspective. Poverty, injustice, and the general-case “problem of pain,” are not, he taught, proofs that the world should bring against the Church. The Church must of course move with the times and periodically reform herself, but the love and sympathy which alleviates suffering, one human reaching to another, is nobody’s possession but the God Who made all heaven and earth — and all men and women in His image. It is a subtle point of deep theology, threatened on either side by the ideologies that can just as quickly be made out of the cause of poverty as they can out of the cause of wealth. In Augustine’s teaching, both the rich man and the poor man prove a sacramental truth to each other before they join forces to make a better society. Read Hollingworth’s full post here.